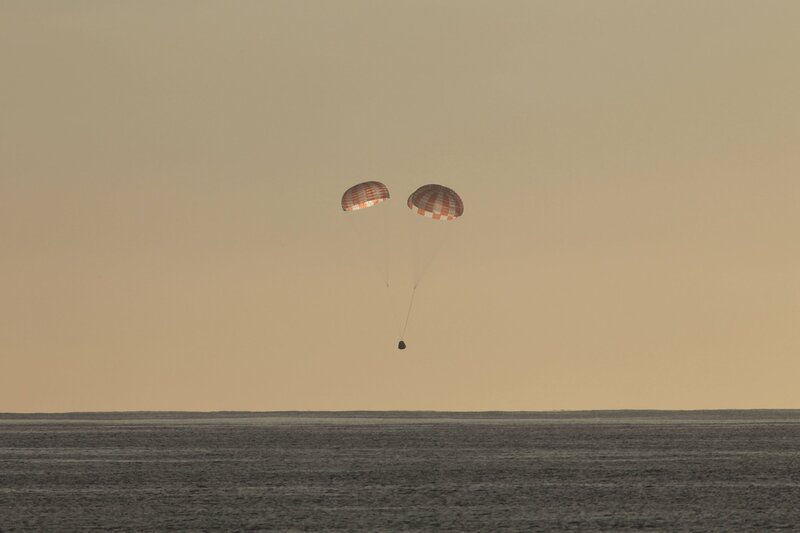 SpaceX’s Dragon cargo craft splashed down in the Pacific Ocean at 10:46 a.m. EDT, about 200 miles southwest of Long Beach, California, marking the end of the company’s tenth contracted cargo resupply mission to the International Space Station for NASA. Expedition 50 astronauts Thomas Pesquet of ESA (European Space Agency) and Shane Kimbrough of NASA released the SpaceX Dragon cargo spacecraft from the International Space Station’s robotic arm right on schedule, at 5:11 a.m.
A variety of technological and biological studies are returning in Dragon. The Microgravity Expanded Stem Cells investigation had crew members observe cell growth and other characteristics in microgravity. This information will provide insight into how human cancers start and spread, which aids in the development of prevention and treatment plans. Results from this investigation could lead to the treatment of disease and injury in space, as well as provide a way to improve stem cell production for human therapy on Earth. Samples from the Tissue Regeneration-Bone Defect study, a U.S. National Laboratory investigation sponsored by the Center for the Advancement of Science in Space (CASIS) and the U.S. Army Medical Research and Materiel Command, studied what prevents vertebrates such as rodents and humans from re-growing lost bone and tissue, and how microgravity conditions affect the process. Results will provide a new understanding of the biological reasons behind a human’s inability to grow a lost limb at the wound site, and could lead to new treatment options for the more than 30 percent of the patient population who do not respond to current options for chronic non-healing wounds. The Dragon spacecraft launched Feb. 19 on a SpaceX Falcon 9 rocket from historic Launch Complex 39A at NASA’s Kennedy Space Center in Florida, and arrived at the station Feb. 23.